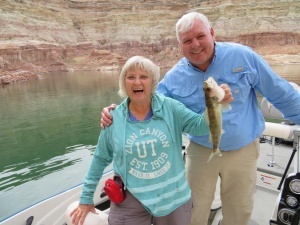 Connie Simmons caught her first walleye with the help of her cousin, Bob Lemons, from Page AZ. May is the best month to catch walleye at Lake Powell. Lake Elevation: 3609 Water temperature: 63-70 F Lake Powell has stabilized with just a bit more water flowing in than going out. Without a large muddy inflow, the crystal clear water remains in more than half of the lake. In the main channel and half way back in most canyons, the visibility is close to 25 feet. There is a mudline in the main channel right at Castle Butte (Red Canyon – Buoy 124). Some side canyons have clear water despite the milk chocolate color in the main channel. Clear water is unusual in May and is caused by a combination of factors. Quagga mussels are the biggest culprit as they constantly siphon and filter lake water on a regular basis. Lower than normal spring water temperatures slowed down plankton production. Lack of rapidly rising water has prevented sand bank sloughing that muddies the water each spring. For now the water is clear except in the backs of some canyons. Smallmouth bass are the fish species most caught this week. Again, try a variety of habitats in your chosen location. Once a smallmouth is caught work that area over hard to catch many more. Reports this week indicated that slick rock outcroppings held more fish than isolated rock slides in the channel. After the spawn in over bass will move to the rock slides but during spawning season look for shallow areas where nest building is detected. Toss topwater lures early in the morning for exciting results.